Do YOU want to know how to make your own blend using essential oils? I can’t wait to teach and train you how to blend in a fun, easy, yet scientific way – where you will learn how to make formulations according to the international fragrance standards. This is something that I did here in France as the owner/operator of an organic skin care company for over 11 1/2 years where I transformed over 120 products from Natural to Organic. It took 7 years to do it! However I did it with a wonderful team and lovely, intelligent chemistry interns from Universities all over France. 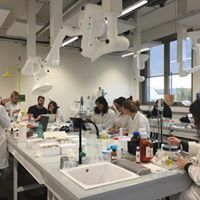 As you can see in the photo below, I continue to teach Masters II Chemistry Students as visiting professor at the Faculté des Sciences, University of Montpellier – teaching them how to use essential oils in skin care products (facial & body). So this is where I am coming from – researching ingredients, developing products that were certified organic by Ecocert and meeting the international standards and European regulations on using essential oils in skin care. Now I am going to share this information with you, in this Essential Oil Blending Workshop. JW Marriott 10 S West St.
How do Essential Oils Work Synergistically? Blending materials are included in the workshop. If you have any questions please feel free to contact me. I can’t wait to make blends with you the safe and effective way meeting the international fragrance standards! This entry was posted in Aromatherapy Training Webinar, Common Scents Book, Ecocert Organic Certification, Essential Oil Blend, Essential Oil Chemistry, Essential OIl Formulations, European Regulations, Formulations, International Standards, News Updates, Skin Care Products on June 7, 2018 by Lorrie Hargis.